Harold G. “Sparky Shaffer, 82, of Catlettsburg, went to be with his Lord Sunday, January 20, 2019 at Cornerstone of Huntington, WV. Mr. Shaffer was born October 20, 1936 in Abbotsville, PA. Sparky retired from the US Navy after 20 years of service as an Electrician, and former owner of Sparky’s Appliance Repair and Sharon Kay’s Ceramics. He was a faithful member of England Hill Free Will Baptist Church where he was a Church Trustee for many years, Choir Leader for 21 years, Sunday School Teacher, and baker of cookies and lemon pies. Sparky is survived by his loving wife of 38 years Sharon O’Daniel Shaffer, brother Robert Shaffer (Rose) of Catlettsburg, and sister-in-law Shelby Shaffer of Fayetteville, NC. 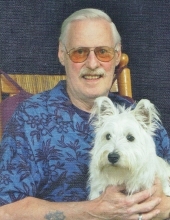 He was preceded in death by brother, Norman Shaffer, and beloved fur baby “Willie”. Funeral Service for Mr. Shaffer will be at 12:00pm, Friday, January 25, 2019 at England Hill Free Will Baptist Church, Mayo Trail Road, Catlettsburg. Pastor Willie May and Bro. Justin May will officiate. Final resting place in Greenlawn Cemetery, HWY 32, Louisa, KY, with Military Honors by Louisa VFW and the US Navy. Visiting hours will be from 10:00am until Service time Friday at the Church. In lieu of flowers donations may be sent to England Hill Free Will Baptist Church Building Fund, P.O. Box 436, Catlettsburg, KY 41129. To send flowers or a remembrance gift to the family of Harold G Shaffer, please visit our Tribute Store. "Email Address" would like to share the life celebration of Harold G Shaffer. Click on the "link" to go to share a favorite memory or leave a condolence message for the family.